Free Path Analyzer Pro Download from FilesPack.com! Graphical traceroute with maps, whois, charts, performance test, etc. Path Analyzer Pro integrates the world's most advanced route tracing software wi th performance measurements, DNS, whois, and specialized network resolution to help investigate network issues. By incor porating all of these powerful features into one simple graphical interface, Path Analyzer Pro has become a must-have to ol for any network, systems, or security professional. 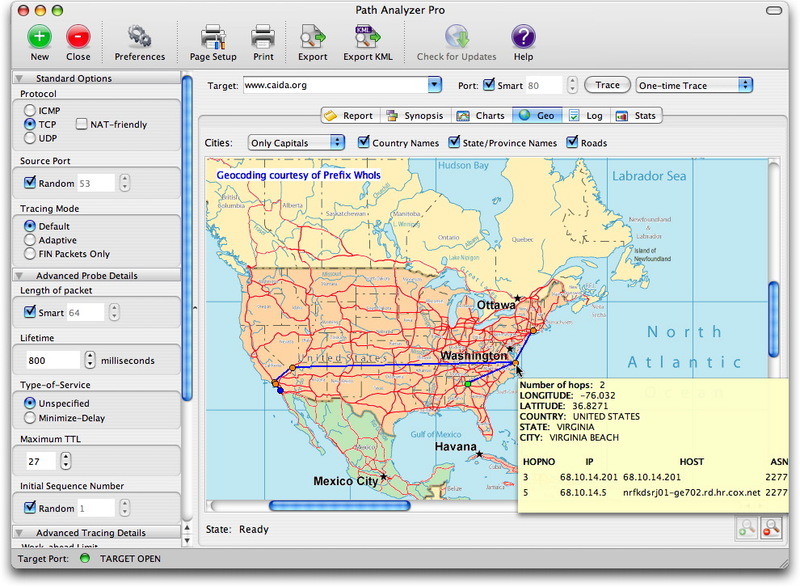 Path Analyzer Pro is available for both Windows and Mac OS X. Features At-a-Glance: Up to 20 times faster than traditional traceroute Stunning report generation and export to impress your colleauges Easy-to-use graphical interface for Windows and MacOS X Vivid charts make network problems obvious Map-based location of IP addresses with zoom, pan, and details Charts and graphs take the guess-work out of performance testing Law enforcement specific features including e-mail address tracing Automatic detection of filters, stateful firewalls, and other anomalies One-time or extended-duration testing for performance analysis Min, max, avg, and standard deviation measurements for each protocol Resolves autonomous system numbers (ASN) based on real-time routing and the features go on and on! You can free download Path Analyzer Pro 2.1 now.